Some trees can be reduced in height and/or spread while preserving a natural tree shape. It is particularly useful if your tree is getting too large for its surroundings. This is a large complex operation that requires skill and experience. It is only really recommended if the other possibilities have been discussed and ruled out. It is important that the correct specification is suggested and worked to. This ensures the tree is not put under too much stress which can result in excessive re-growth, poor growth attachment and in the future an unsound tree. 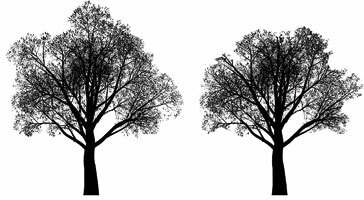 For example on certain trees a 12% reduction of the lateral length of branches across the entire tree (length) can result in a 30% loss of leaf volume. In extreme cases it may be worth considering removal of the tree and re-planting with a more suitable species.